* Free convert 4K video from HEVC to H264 or vice versa at GPU accelerated speed. * Edit 4K hevc video (Trim, Crop, Effects, Subtitles, etc.) on GPU, no burden to CPU. It's reported that roughly 80% of internet consumption will be video by 2019 and that 4K Ultra HD will become the standard. However, H264 isn't ready for the huge volumes of data it would take to encode 4K 2160p video. That is why a new video compression standard HEVC is peeking over the horizon. Compared with H264, HEVC (H265) brings much better compression ratio for 4K UHD video, averagely reducing 64% bit rate for 4K video while keeping the same level of quality. On account of HEVC higher coding efficiency, more and more devices support recording 4K UHD video at HEVC codec, including Apple iOS 11-based iPhone X/8/7/Plus, iPad (6th Gen.), iPad Pro (10.5 inch/12.9-inch 2nd Gen.), GoPro Hero 6, Drone, surveillance equipments, Samsung Galaxy S9/S9+, etc. And what's better, the shipment of HEVC enabled device keeps rising by roughly 35% every year. 4K HEVC is being vigorously developed. Part 1 - How Demanding is 4K HEVC? Part 2 - What Can Solve 4K HEVC Video Processing Problems? Undoubtedly, HEVC is quite impressive in reducing over 60% of the bit rate and delivering a whopping 50% - 80% bandwidth saving. Yet, a video compression standard without faults will never be found. The higher coding efficiency of HEVC comes at a price: increased computational complexity, which demands up to 10X more compute power than H264 in 4K video processing and therefore makes it troublesome to transcode, edit, resize and play 4K HEVC video. Before you upload iPhone X recorded 4K HEVC video to YouTube, Vimeo, Dailymotion, Instagram and more SNS, majority of you are willing to transcode HEVC to H264 first to ensure that your video can be smoothly watched by as many viewers as possible. However, you would find that it takes seemingly forever to decode and encode HEVC to H264. This results from the much more complicated techs and algorithm HEVC adopts. Generally, the VP9 encoding time is 130X more than H264 while HEVC is even 7 times more than VP9 in encoding time. When you play DJI PSP 4K HEVC (x265) video in your VLC player or play online YouTube h265 video on Safari, there is high likelihood that your CPU temperature is overheating and sometimes your desktop even automatically shuts down or starts chugging in this demanding HEVC 4K UHD video playback. If the CPU temperature reaches 80°C or higher, it might be related with your throttling, along with high voltages, which could destroy your CPU within months to a year. You can stream Ultra HD video as long as you address the entry-level requirements of bandwidth: 25Mbps for 4K Amazon Prime Instant Video/Netflix and 50Mbps for 8K video streaming. HEVC (H265) comes out as a game-changer, helping you stream 4K/8K HEVC video at respectively 12Mbps and 25Mbps, almost half of the network bandwidth saved. Yet, this comes at the cost of high CPU usage, sometimes even 100% of CPU usage, which severely impacts other tasks processing. Video editing is a very hardware intensive task. It's especially high demanding on your CPU, GPU and memory (RAM at least 8GB). Still, it's also closely related with what kind of video codec you are using, video resolution, bit rate or whatever. The general SD video editing has already required high-level hardware configurations, let alone the 4K Ultra HD video in HEVC with increased complexity in algorithm. That's the reason why your laptop lags and freezes when editing GoPro Hero 6 4K HEVC video in iMovie/Final Cut Pro 10.4.2 or editing DJI P4P video in Premier. Currently, the latest versions of Safari, IE (11) and Edge (16/17/18) browsers officially support 4K HEVC (H265) video online playback. Yet, these browsers crash randomly when playing online 4K HEVC video. This is caused mainly by the incapable 4K HEVC decoding ability when it comes to the complicated HEVC codec. All the above-mentioned problems during 4K HEVC processing are triggered by HEVC intensified computational complexity, which, in another words, places more burden on the CPU processor of your computer. That's why you encounter snail-paced speed, CPU overheating issue, high CPU usage and laptop lagging problems. To tackle these issues, the most essential solution is to offload the compute-intensive tasks from CPU to GPU. What can achieve this goal? 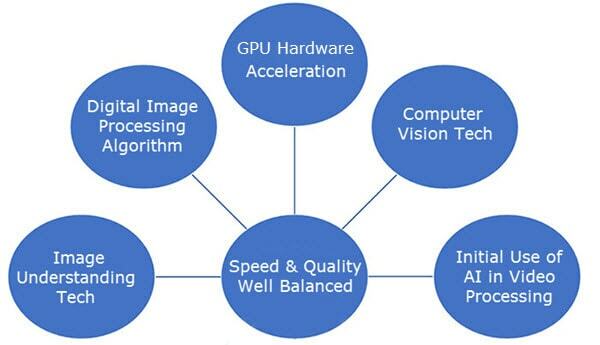 The answer is Hardware Acceleration, which is the use of GPU processor's dedicated media processing capabilities to perform the burdensome 8K 4K HEVC video processing tasks more efficiently than is possible in software decoding/encoding running on a general-purpose CPU processor, with the result that CPU can be liberated from processor intensive tasks and participates in other tasks to ensure a better responsiveness. The commonly used GPU HW acceleration techs cover Intel Quick Sync Video, Nvidia (NVENC API/NVDEC API) and AMD. Hardware acceleration tech isn't accessible unless the 4K HEVC video processing tool is also GPU-accelerated computing supported. Though some video processing programs boast themselves of HW acceleration supported, they just deliver part of HW acceleration techs. Currently, only macXvideo is 100% exactly what it claims or better, supporting GPU hardware acceleration tech (Intel/Nvidia/AMD) for 4K HEVC video transcoding, compressing, editing, etc. at 5-8X faster speed than normal tools. When it comes to convert HEVC to H264 or video to HEVC, the ordinary HW supported HEVC video transcoder is single-handed: able to utilize GPU hardware acceleration techs (Intel/Nvidia/AMD) in hardware encoding video to HEVC or HEVC to H264/VP9/VP8 while no power to activate GPU hardware acceleration in video decoding or video processing. Things are different with macXvideo, which, with hardware decoding, processing and encoding supported, aimes to upshift video converting, compressing, editing and playing process. Thus, the whole 4K HEVC transcoding can be speeded up to 5X faster. Well, in the current market, only MacXDVD, the leading multimedia software developer, listens to users' call for faster speed and faithfully implements what users ask for in 4K HEVC video processing. 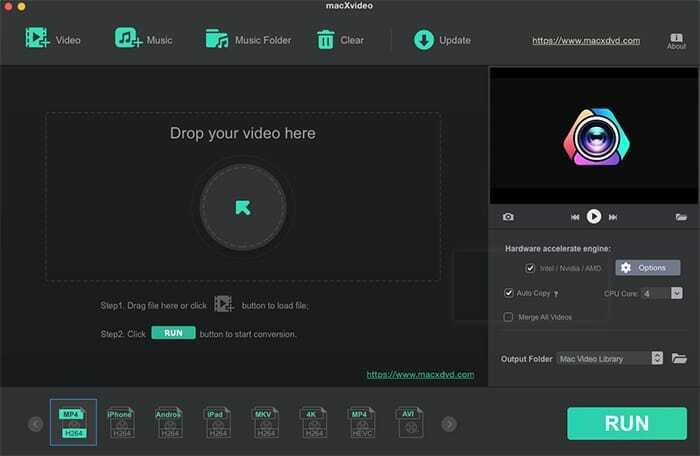 Then, MacXDVD brings you the No.1 fast GPU hardware accelerated macXvideo to decode/encode, resize, play and edit 4K HEVC video at 280-320FPS while keeping visually no quality loss. >> Check if your HW configurations support GPU HW acceleration. Some, if not all, might feel puzzled about the middle phase - 4K HEVC video processing. It's known to all that 4K HEVC video compression and editing are full of large-scale yet complicated computations. Since 4K HEVC video processing involves with video compressing, resizing and editing procedures, how could macXvideo boost the processing speed while remaining virtually 1:1 quality? This gives the credit to the below advanced techniques used in macXvideo. The advanced digital image processing algorithm used in macXvideo is mainly targeted at image segmentation, which excels in fast extracting the meaningful blocks (or frames) from 4K HEVC video image and then providing the basic foundation for the following intra and inter prediction. Afterwards, the latter removal of spatial redundancy and temporal redundancy can successfully proceed. Meanwhile, its built-in image intensification and image restoration methods can dramatically improve the 4K HEVC video quality, e.g., enhance image sharpness, eliminate noise, etc. The complete structure of image understanding tech used in macXvideo is composed of 4 hierarchies: data hierarchy, description hierarchy, cognition hierarchy and application hierarchy. Among them, the cognition hierarchy is regarded as the engine of image understanding, which can figure out the main target of the video image and the relationships among different targets. This is helpful in quickly identifying the unnecessary elements in the video image and remove perceptual and statistical redundancy to compress and resize 4K HEVC video to smaller. The chief mission of computer vision tech is to process the video data and conclude the three-dimensional scene of the video (similar to Human Visual System). Afterwards, it can correspondingly adjust and fix video definition, video brightness, video saturation and video scene freezing issues to guarantee you the highest possible quality of output video. To be specific, it's quite suitable to process and resize 4K 360° video, 4K VR video and 4K HEVC video with special effects. The current artificial intelligence technique hasn't developed any groundbreaking coding method, transport protocol or interaction technique. Yet, AI has already penetrated into pre-processing, post-processing, super resolution, machine vision, etc. macXvideo applies the post-processing and super resolution techs of AI into large-sized HEVC video processing. When your video processing encounters varied objects, larger movement, rotation, etc. complex cases, the AI post-processing in macXvideo plays a big role to quickly recognize different objects and adjust the movement intensity to improve processing efficiency. Besides, the AI super resolution tech in macXvideo can also help you promote lower-resolution video quality to much higher level. GPU hardware acceleration is the silver bullet for your high-demanding 4K HEVC video decoding, encoding, compressing, resizing and editing. The unique Level-3 HW accelerated video processing software - macXvideo makes 4K HEVC video processing (the used time-consuming and compute-intensive chore) into something you can take care of in just a few minutes. How does macX' GPU HW acceleration affect in 4K x265 video processing? Read on. You've already annoyed a lot by the 4K HEVC video incompatibility issue when uploading iPhone X recorded 4K HEVC to Instagram Dailymotion and importing GoPro 4K H265 to Premier Pro. What makes you even more head-scratching is that your 4K HEVC video transcoding seemingly goes on forever. Luckily, the cure-all HW acceleration can give a great boost on your 4K HEVC video converting. Step 1: Free download GPU accelerated macXvideo on your computer. Step 2: Fire it up after downloading and installation are finished. 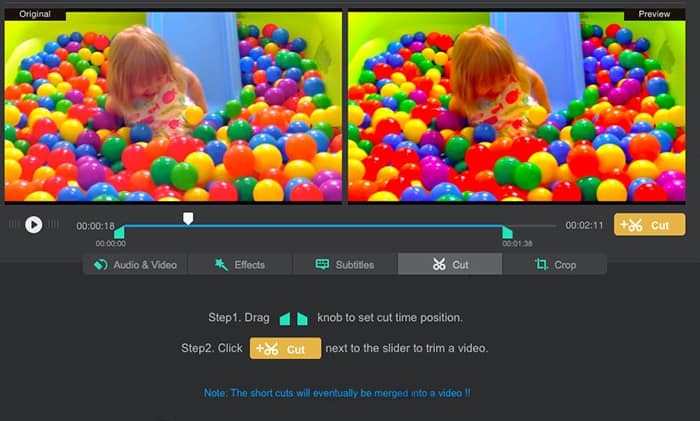 Tap "Video" to import your iPhone or GoPro recorded HEVC 4K video or drag-drop files into it. Step 3: Choose the output video codec and format you need from the preset output profiles at the bottom of the interface. To upload iPhone 4K HEVC video to Instagram, YouTube, Dailymotion or add GoPro 4K to Premier Pro for editing, you're suggested to select "MP4 (H264)" from General Profile. 4K MP4 video profile is also available if you don't wanna downscale 4K resolution. Note: Your HEVC video can be encoded either by hev1 or hvc1 subcodec. For those who're disposed to import HEVC video to QuickTime, Final Cut Pro or iMovie for playback/further editing, you're suggested to choose "MP4 Video (HEVC)" from Mac General Video, for this HEVC video converter can successfully convert HEVC from hev1 to Apple supported hvc1 subcodec. Thus, you can import HEVC (hvc1) video to QT, FCP or iMovie without failure. Step 4: Check if the Hardware Encoder "Intel/Nvidia/AMD" is automatically ticked. If so, it means the GPU hardware decoding, processing and encoding are activated by macX. If not, please resort to another highly configured computer with GPU hardware acceleration tech supported. Shift your attention to "CPU Core" at the lower right corner of the main interface, where you can select multiple CPU core usage to further accelerate 4K HEVC video transcoding speed. 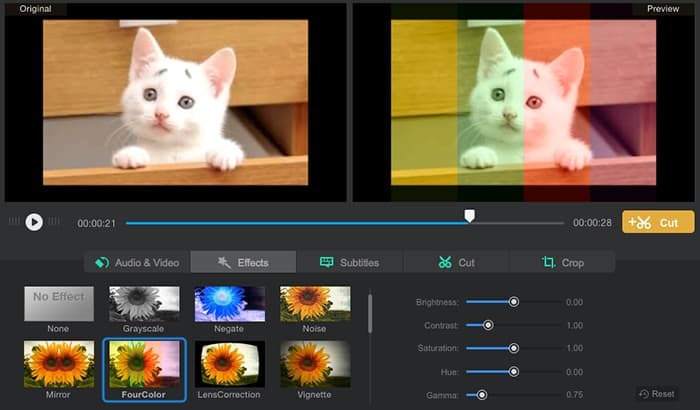 Generally, this 4K HEVC video processing tool automatically chooses the max extension. You can properly choose 4 cores out of 6 or 6 cores out of 8 if there is another contemporaneous task running on your PC. Step 5: Tap "RUN" button and this 4K H265 video converter hands over the video converting task to CPU. > CPU receives the 4K HEVC transcoding instructions and assigns the compute-intensive tasks to GPU. > GPU begins to apply its matrix computation into hardware decoding, processing and encoding 4K HEVC video and saves the video data on its buffer memory. > GPU feeds back to CPU when the task is finished. > CPU receives the feedback and reports back to macXvideo. macXvideo eventually exports the output video file. The procedure is clear. Yet, how many times faster the hardware accelerated 4K HEVC converting than normal conversion? The actual test explains everything. Note: this 4K HEVC video conversion test is conducted on an iMac 27-inch (2013) with 3.2GHz Intel Core i5 processor, 16G 1600MHz memory and NVIDIA GeForce GT755M 1GB graphics card. From the above table, it's clear to see that the hardware acceleration can make 4K HEVC video transcoding speed up to 5X faster than before. What's better, if you upgrade your computer configuration, for example, upscale integrated graphics to discrete graphics, improve lower-end graphic card to higher-end graphic card or double your graphic cards, the 4K HEVC video decoding and encoding speed will be even improved up to 8X faster by macXvideo. HEVC video editing is rather challenging for your computer configurations, let alone 4K Ultra HD HEVC video. Double burden to your hardware configurations (esp. CPU). That's why you have a higher possibility to meet GoPro 4K HEVC video editing problems like your laptop is freezing and lagging while editing GoPro 4K hevc video at 60fps; computer auto shuts down when editing 2160p video in H265. Fortunately, with this GPU HW accelerator, your heavy 4K HEVC video editing task can be assigned to GPU, instead of CPU, so as to dramatically lessen CPU burden to solve laptop lagging issue. So if you can't bear GoPro video editing lagging problem in a HW acceleration unsupported editor, macXvideo is your best option. Well, how to smoothly edit 4K HEVC video in this video editor? Easy peasy. Note: Considering 4K HEVC video editing is far more demanding than 4K h265 video converting, you're suggested to edit GoPro Hero 6 4K HEVC video on a high-end computer with Nvidia NVENC API & NVDEC API HW acceleration (Nvidia works even better than Intel QSV and AMD). And your graphics card should be at least Maxwell (GM206) with Quadro M2000. Well, when the hardware configurations reach the entry level, use the HW-accelerated macXvideo to edit now. Step 1: Click "Cut" feature on the home screen. 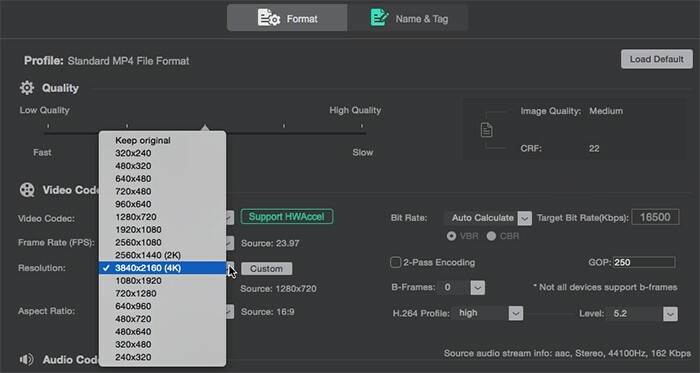 Followed by the free adjustment on your video duration: set up start time and end time to save the highlights of your 4K H265 video and remove unnecessary clips to shorten video length. It goes very smoothly, no lagging issue on your computer. Step 2: Enable "Crop" icon to adjust video image width and height to fit the size of your GoPro video playback device. The default preset is "Crop Letter Box", but you can choose from another 6 modes, including Free, Keep Current, Keep original, 16:9, 4:3 and 1:1. Step 3: Tap "Audio & Video" icon to rotate your GoPro video 90/180/270 degree, adjust audio volume, video playback speed and tick "Recalculate Time Stamp" to fix video audio out of sync issue. Step 4: Hit "Effects" icon and you can add special effects to customize your GoPro 4K HEVC video, including grayscale, negate, noise, mirror, fourcolor, lens correction, etc. 16 effects. Step 5: Activate "Subtitle" feature and then you're allowed to add external SRT subtitles to your GoPro 4K H265 video to customize it. When everything is done, tap "Apply to all" > "RUN" option. It will instantly handle over the video editing task to your throughput-oriented GPU processor, which will immediately involve in the motion vector prediction, motion compensation, intra & inter frames compression, DCT, quantization, entropy coding, etc. matrix operation related processes. Thus, the responsiveness of your laptop or computer won't be affected by the burdensome 4K HEVC video editing. Big News: MacXDVD is planning to apply AI voice recognition technology into macXvideo to make audio automatically translate to text and even translate into different languages. Thus, you don't have to download/add srt subtitles and meet video subtitles out of sync problem. This AI feature will come in the near future. Please keep an close eye on the developments. One minute of an iPhone X recorded 4K HEVC video is up to 400MB, the same of GoPro Hero 6 video up to 600MB and DJI P4P up to 750MB. Needless to calculate the specific file size of an hour 4K HEVC video, you can just imagine how large the 4K HEVC video would be. Consequently, when you're prone to upload GoPro video, drone video or iPhone 4K HEVC video to YouTube, Facebook, Vimeo, you have no choice but to resize large-sized 4K HEVC video. How does hardware acceleration of macXvideo work in 4K HEVC video shrinking? * Convert and transcode 4K video from HEVC to FLV, WMV, etc. video codec with better compression ratio at certain cost of quality loss. * Downscale 4K 2160p to 1080p or 720p to reduce 4K HEVC video size. * Make full use of Cut & Crop features to delete unnecessary clips from 4K H265 video and shorten video length to make video size smaller. * Lower down 4K HEVC video bit rate around 20% - 40%, change frame rate from 60FPS to 30FPS, etc. to further compress 4K HEVC video. As you can see, the whole 4K HEVC video shrinking procedure involves HEVC video transcoding, parameter adjustments and HEVC video editing, which is almost unbearable to your CPU processor if it's the only main force. Fortunately, this macX hardware accelerator cuts the buck to resize 4K HEVC video at 5X faster speed under the help of GPU processor. The video compression is the process to remove data redundancy. When hardware processing acceleration is activated, the 4K HEVC video data redundancy removal task is handed over from CPU to GPU processor, which can simultaneously process much more coding units, prediction units and transform units to faster filter the redundancy data. And with hundreds of heavily pipelined ALUs and threads, GPU can accomplish motion prediction, motion compensation and intra/inter frame compression to remove spatial, temporal and statistical redundancy at much higher throughput and shorter time than the general-purpose CPU. Thus, your 4K HEVC video file reduction can be finished with 80% less time compared with the past while greatly improving system responsiveness. You probably have misunderstanding if you think the 4K HEVC problem leaves you alone after you convert and edit 4K HEVC video. The 4K HEVC video problems come one after another. Here it is when you play 4K HEVC video on your Windows 10 or macOS High Sierra. Dozens of users complain a lot about 4K HEVC video playback, including drone 4K HEVC video won't play, GoPro video stuttering/freezing, surveillance video choppy in image, etc. You know the problem is mainly resulted from HEVC intensified computational complexity. So to lower down the computational burden from your CPU processor, the GPU hardware decoding plays a significant part in 4K HEVC video playback. When it comes to the GPU hardware decoding supported HEVC video player, VLC media player might be the first to appear on your radar. Yes, it does support DXVA HW decoding for Windows and Video Decoding Acceleration (VDA) for macOS. Both VLC versions are suitable for H264 video hardware decoding. As for HEVC (H265), the latest VLC version doesn't upgrade to support HEVC GPU decoding. Hence, you look somewhere else for HEVC player or instead, try on this VLC alternative 5KPlayer - HEVC hardware decoding supported from DXVA/Intel/Nvidia (PureVideo), to GPU decode HEVC for smooth 4K HEVC video playback without any stuttering, freezing or video choppy problems. 1. If these problems occur when playing back 4K HEVC surveillance video in video player like blurry image, abnormal brightness, color cast, noise interference, etc., there is something wrong with your surveillance device, not the video player. To troubleshoot these surveillance video problems, you can consider to use video image quality diagnostic system to correct these problems. 2. It's reported that the current Pensieve AI technique can pick out the best algorithm from several different algorithms to ensure the smooth playback of 4K HEVC video at highest possible quality according to your present network condition. This AI tech can help 4K HEVC online video playback at 10-30% faster speed than the traditional algorithm while maintaining the video quality improved 10-25%. Therefore, providing you find a Pensieve supported video player, you can play 4K HEVC online video with 10-30% less time for video buffering. 1. Windows 10 operating system is the basic demand. 2. GPU memory should be at least 4GB to handle 4K 2160p video processing. 3. Graphics card is supposed to have 256 bit memory bus as the entry level. 4. The minimum standard of GPU frequency is roughly 1 GHz. 5. Integrated 4K UHD panel is asked for Windows laptop. 6. 4K UHD panel with HDCP2.2 is needed for Windows desktop. 7. System with HDMI2.0 or DisplayPort output is an essential condition for Windows desktop. 8. HDMI2.0 or DisplayPort cable is a must-have for 4K HEVC premium content playback on Windows desktop. Nothing would be cooler than HEVC for 4K video encoding. Is that true? Actually, the market standing of HEVC is now threatened by the rising-star AV1, which is estimated to encode 4K video at 43.90% higher coding efficiency than HEVC (x265) while keeping almost 1:1 high quality. What's plus, AV1 has fatal attraction to users when it comes to compare AV1 with HEVC in royalty fees. It's totally free for any of you to use. Where AV1 falls down is that the current AV1 can not be supported by GPU hardware acceleration techs in HD/4K UHD video processing. There is compelling reason to believe that the GPU acceleration tech for AVI is coming soon. By then, which video compression standard do you prefer, HEVC or AV1? Welcome to express your perspective of view in the comment zone. Convert and process video with CUDA accelerated converter. Simple way to compress 4K HEVC, H264 video on macOS. Encode video (4K/8K) to HEVC x265 at GPU accelerated speed. * Sign up for latest news and special offers.